Scenario: You are an archeologist working in the Middle East excavating a site that is about 2000 years old. You uncover two items that look like seeds. Any idea what kind of seeds they might be? Edit: For this week's challenge, 5 points for the first identification, 1 point for each subsequent correct answer. Please use the same name for all the challenges so I can keep track of your points. Good luck! Challenge 5 is now closed. Only 3 more challenges to go. 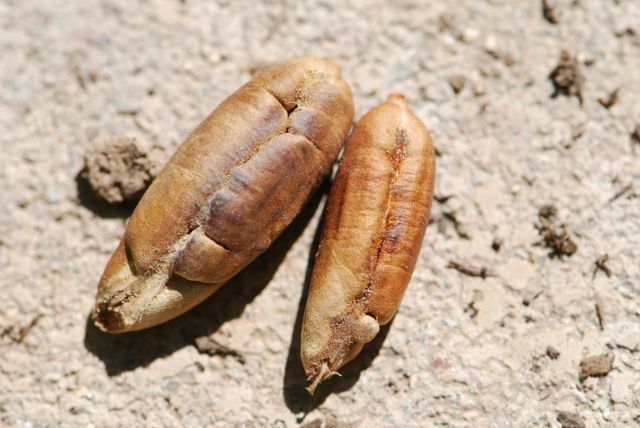 As everyone realized, the shagbark hickory nuts (Carya ovata) would not have been found in Phoenix, so the truck had probably been out of the state. Challenge 3 is now closed. Thank you to everyone who participated. The answers to challenge 4 will be revealed next week. Son't know what they are, but I like how they look like little loaves of Italian bread. I guess dates from Palm, too.